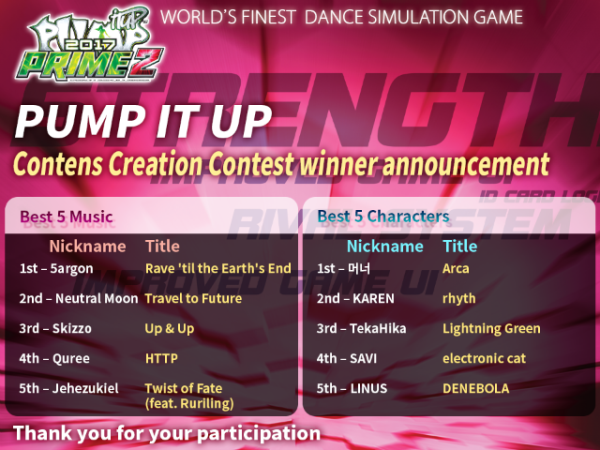 We are pleased to announce that the winners of PIU Contents Creation Contest. The evaluation of the contest including the “Like” of Facebook are completed. There have been various opinions from judges to select BEST 20 before, so BEST 20 works could not be predicted until the final result. The judgement was more careful In this final BEST 5 selection, because we took into consideration the number of Facebook “Like”. After intense discussion, the judges gathered all opinions and the final BEST 5 was decided as below. Despite the inevitable rankings due to the nature of the contest, we could see a great deal of efforts in all the works regardless of the score, and all works made our ear and eyes happy during evaluation. We would like to offer our sincere thanks to all participants, and will email to the winners regarding the awards later. Copyright © 2019 Andamiro Co., LTD. All rights reserved.